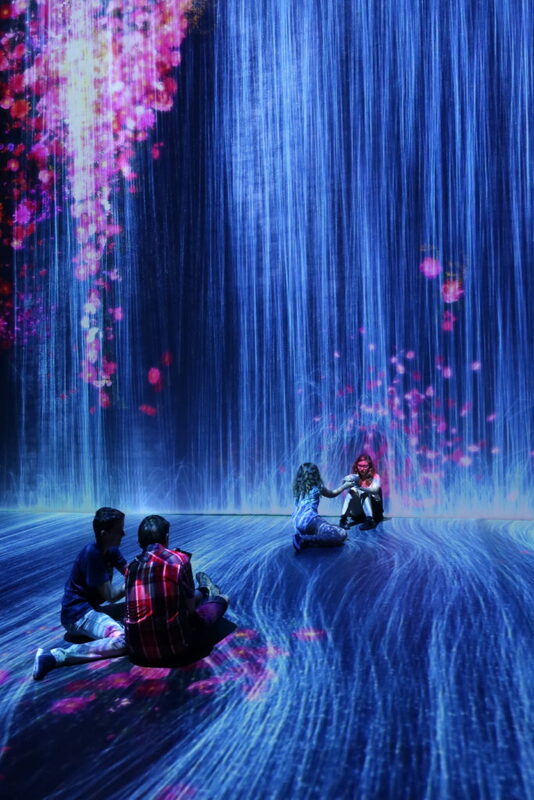 Val de Rosemont de Giromagny College is the 2018 winner of the Price of Artistic and Cultural Audacity of the Culture & Diversity Foundation – College category for its project « Le Temps de la terre ». 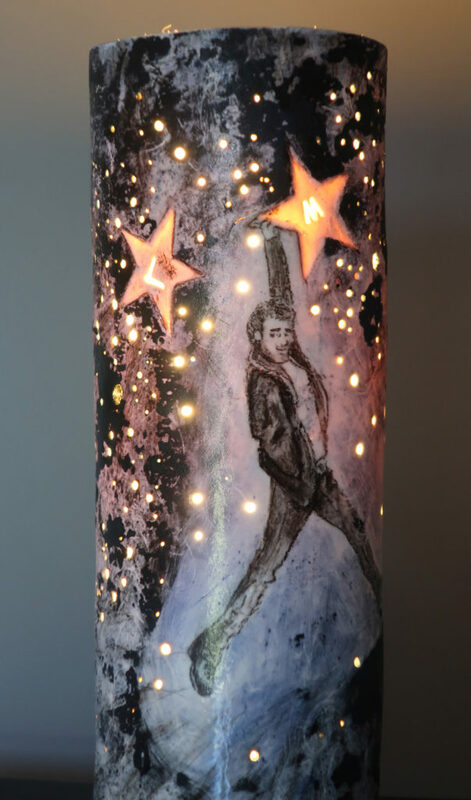 Marina Zindy, plastic arts teacher and ceramist, initiated and coordinated this project. 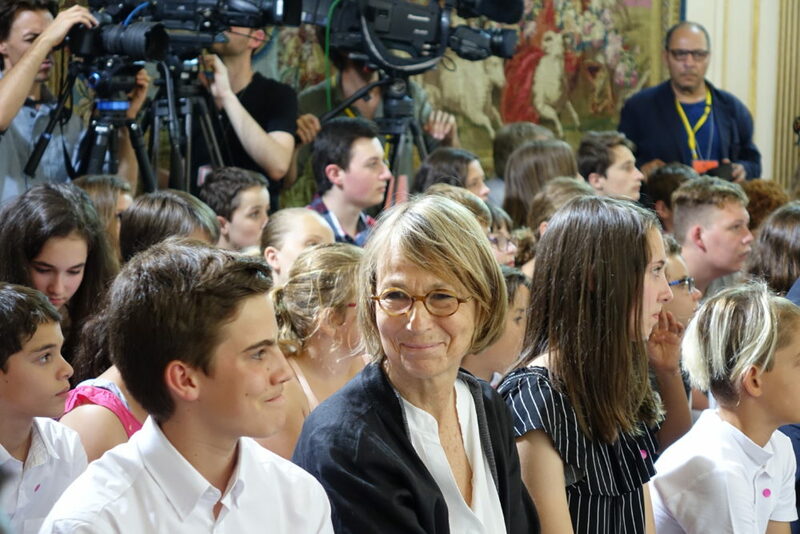 Two students presented the project and were awarded the prize by Françoise Nyssen, Minister of Culture, on Friday 29 June 2018 during a ceremony held in Matignon in Paris, with the presence of Prime Minister Edouard Philippe and the Minister of National Education Jean-Michel Blanquer. 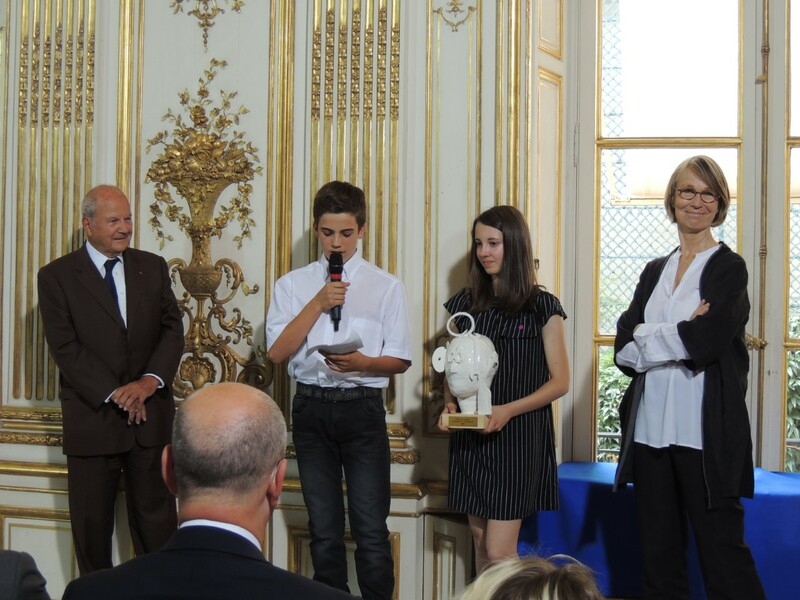 The prize for artistic and cultural audacity was created in 2013 at the initiative of Marc Ladreit de Lacharrière, President of the Culture & Diversity Foundation (on the left of the image), in order to promote the work carried out daily in the field by teachers, artists, cultural institutions and associations with local authorities to familiarise students with the arts and culture. Supported by the Cultures Collèges department, the Collège Val de Rosemont was first selected at the academic level to represent Franche-Comté and then Bourgogne-Franche-Comté. Nearly 80 applications were pre-validated at national level by the Rectorates and the Regional Cultural Affairs Departments, then studied by the Culture & Diversity Foundation. 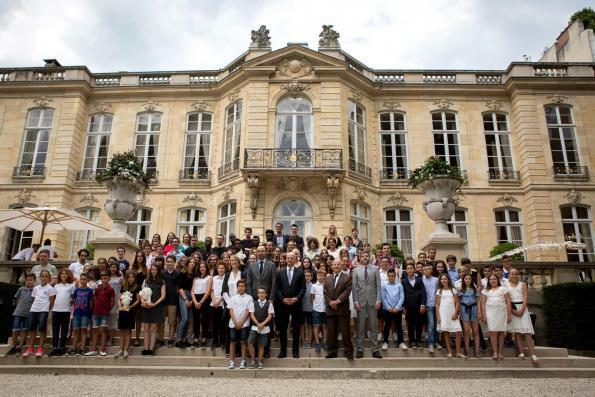 Five were then selected for each category ( elementary school, middle school, high school) before being submitted to a jury chaired by Jamel Debbouze. 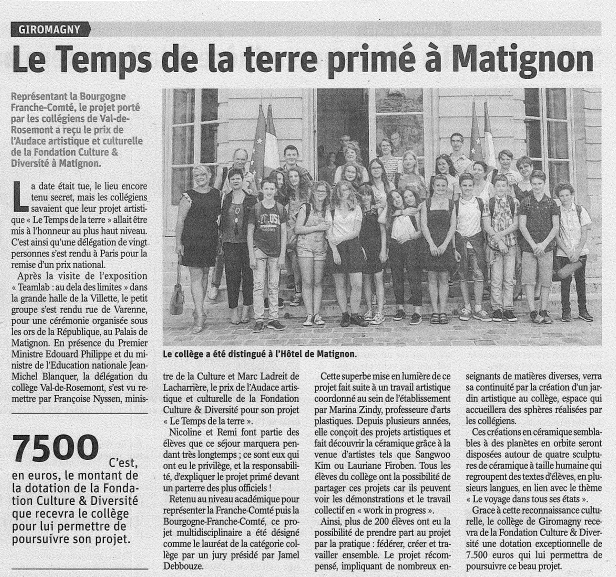 Twenty students were able to go to Matignon in Paris for the award ceremony Audace artistique et culturelle. More than 200 students were involved in the project this year. Two students, Rémi Lorenne and Nicoline Thomas explained the project in one minute each. Pierre Hauwelle who made us discover clay, amazed us, students and adults, during the shooting workshop last year and welcomed us in the IEAC premises this year. Both are trainers at IEAC. Three teachers, Ms Geiger, travel project coordinator, Ms Perrin, ERASMUS+ project coordinator and Ms Zindy, » le Temps de la terre » coordinator, accompanied the students with Ms Artioukhine, the school’s principal assistant. 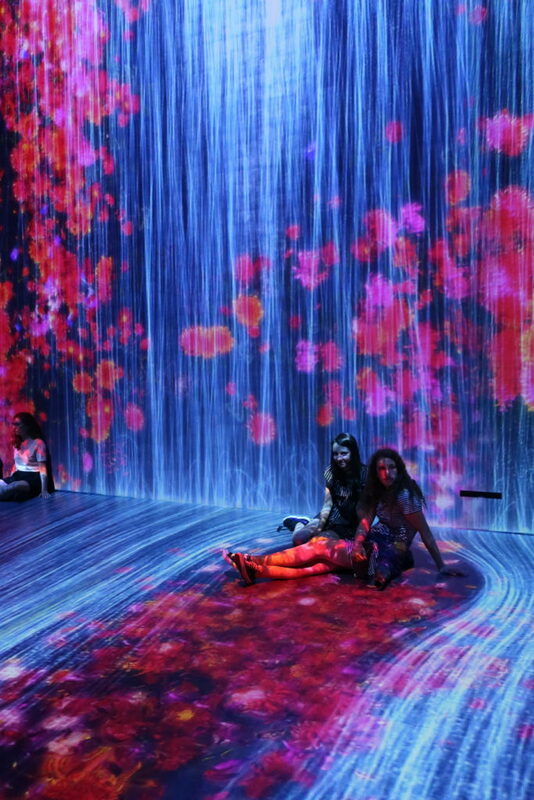 The students were amazed. They really enjoyed this marriage of poetry and technology. As Matignon was not far from a designer market, Place St-Sulpice, we could see the work of many ceramists. A great joy! Finally, the expectation and excitement of being able to enter Matignon! 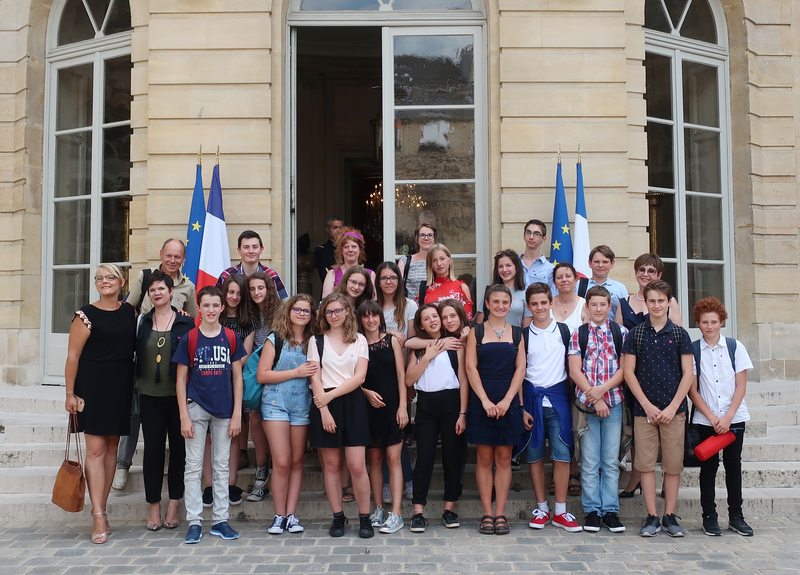 We were among the last groups to enter Hotel Matignon… Fortunately! 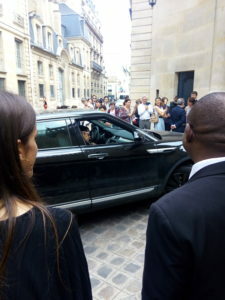 Because we were able to see a star getting out of his car. I was able to take a picture with the president of the jury, Jamel Debbouze. 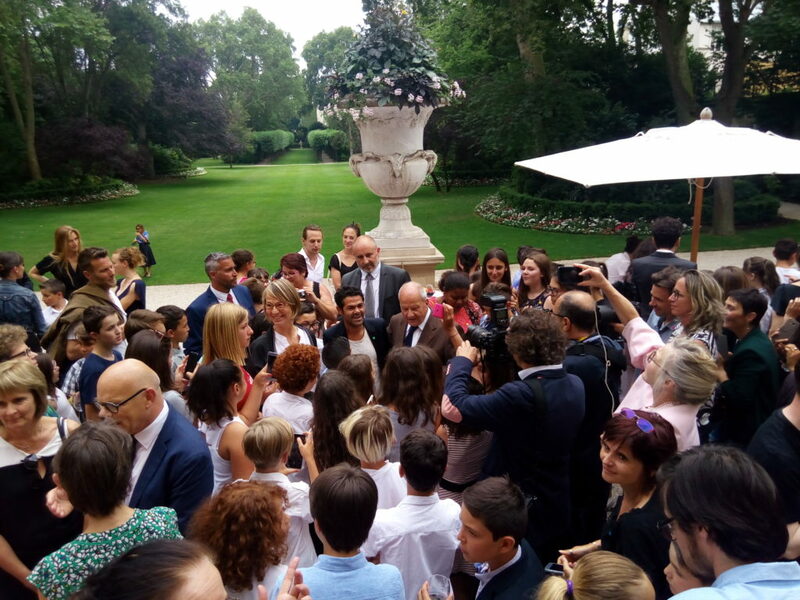 The winners were received by Prime Minister Edouard Philippe, Minister of National Education Jean-Michel Blanquer. The Minister of Culture Françoise Nyssen and the President of the Culture & Diversity Foundation Marc Ladreit de Lacharrière. The ceremony went very well and was moving. Students were invited to pose around the Prime minister. 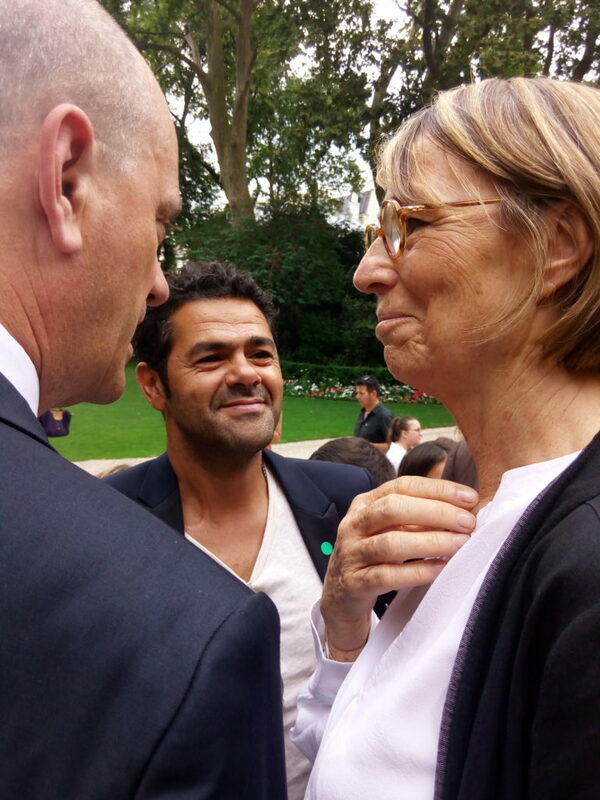 During the snack time in the garden, the President of the jury, Jamel Debbouze came to greet us and sign autographs. I took these pictures when Maël and I were trying to reach him. Maël then asked him if he could make a fingerprint in a clay ball to be able to collect a trace of this meeting. He tested the material between his fingers and proposed a mini sketch by applying the clay, not on his finger but on his nose! The comedian did not hesitate and revisited the clown nose under a more natural aspect. A unique moment, a brief but real exchange. I then asked Mr Blanquer and Mrs Nyssen for their fingerprints. 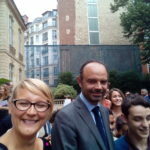 Mr Blanquer, Minister of National Education, Jamel Debbouze, artist, and Ms Nyssen, Minister of Culture. I had imagined an evolutionary mosaic several years ago at Val de Rosemont College. Whenever there was a meeting, with other students, other speakers or other adults, we could materialize this event by adding a line to this monumental fingerprint. The three VIP prints will be baked and displayed in the mosaic at the beginning of the school year because the students are on holiday! 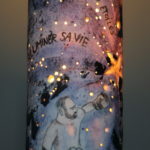 Having the chance to be invited to Matignon, I made a ceramic for the Prime Minister and for the President of the Jury, Jamel Debbouze. 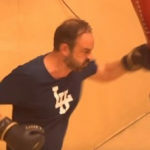 Edouard Philippe practices boxing, that’s why I chose to represent him in action. He « takes down the stars » to « illuminate his life ». The porcelain is translucent at the level of the star and its heart, the light emanates when the photophore is turned on. There are three stars with a letter each : the first letter is related to his wife’s first name and the other letters are related to his two children first names. Jamel Debbouze was very touched and thanked us.